The EuroCave “Vin au Verre” is a refrigerated serving unit made up of two separate red and white wine compartments. It enables you to keep 8 bottles (4 red and 4 white) ready to serve, preserve open bottles for 2 to 3 weeks, and to store an additional 8 bottles at a perfect temperature for serving. With its stainless steel body, the EuroCave “Vin au Verre” combines class and distinction. Its elegant appearance enables it to blend with every style of interior design. Its double glazed front ensures optimum heat insulation and provides a perfect presentation for your fine wine. Using to electronic adjustment, each compartment can be separately set to the right temperature (15°/19°C for red wines, 6°/12°C for white and rosé wines). By referring to the outside gauge, you can monitor and modify the temperature settings of both compartments whenever you wish. The pressure valves are simple to use so loading bottles of any size (e.g. magnums) is very easy thanks to the ball joint fitted to the wine suction system. Locking of the taps and door allows you to easily secure access to the wine when you have finished serving. 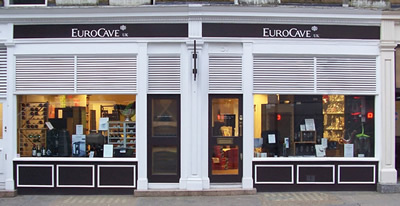 The EuroCave Vin au Verre lighting system is created using LED’s. These provide UV free lighting, produce a negligible level of heat and use very little electricity. The deep amber lighting emits a warm glow and displays your bottles to their best advantage.